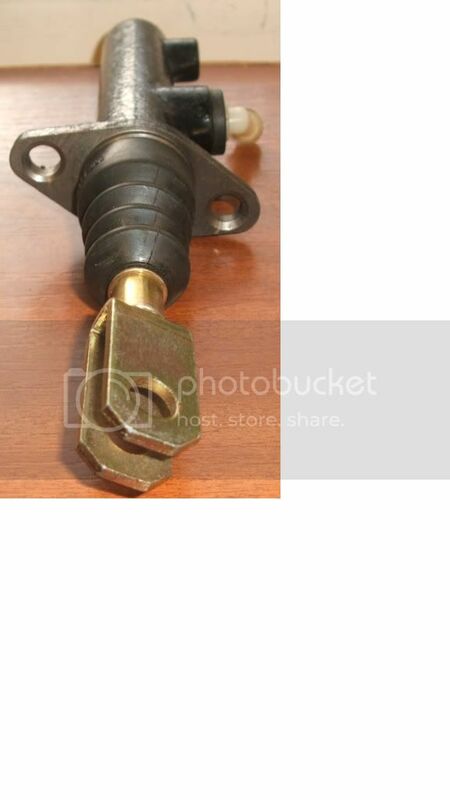 I am looking for a clutch master cylinder for my QV24, Right Hand Drive. Knew that RHD version is difficult to find, but hope that folks here might know where to find one. 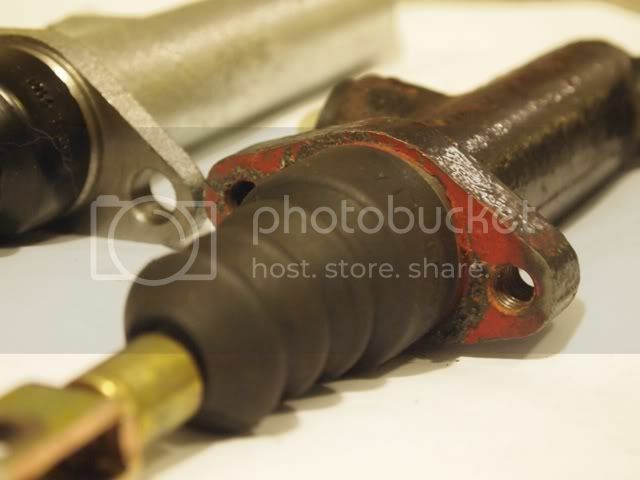 Parts number is 82451850 (former reference was 60809183). Thanks. Alfist might have one, send him a pm. 164 TD wrote: Alfist might have one, send him a pm. Khung, what is the partnumber youre looking for? Hi, khung is my other 164 pal in Hong Kong. 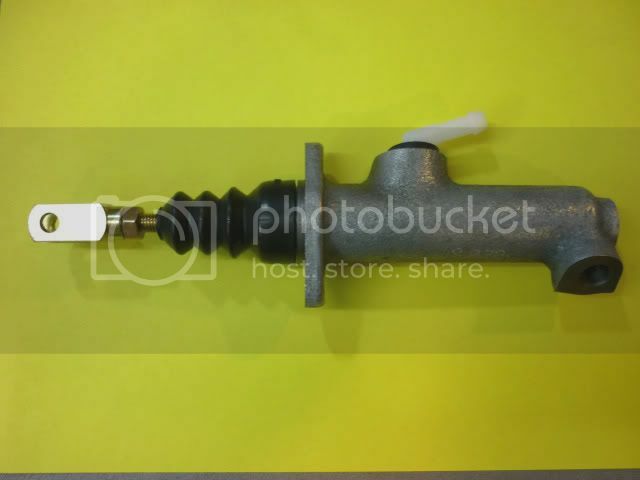 Anyway, Parts number for a clutch master cylinder right hand drive is 82451850 (former reference was 60809183). KY2006 wrote: Hi, khung is my other 164 pal in Hong Kong. 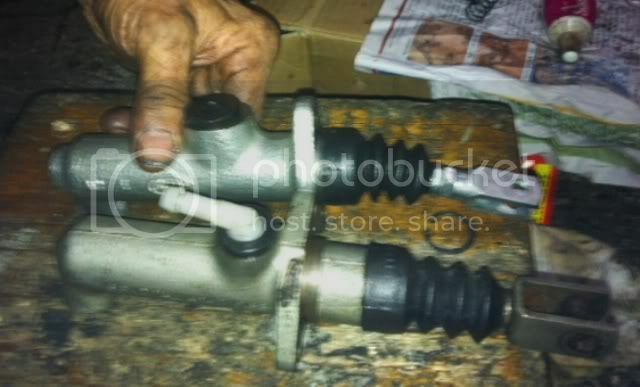 Anyway, Parts number for a clutch master cylinder right hand drive is 82451850 (former reference was 60809183). Sorry, for mistaken your name. I will try some friends in England if they can get anything. Thanks. I have too posted a request in the UK AO site, but not much luck so far. I am curious how other 164 owners manage to keep their QV going - clutch master will wear out and have to be replaced at some point? Sad story! This will be a real problem in the future. If you do overhaul the master brake cilinder then please let us know how it go's. There are more people to come with this problem. Will do. Would also like other folks driving RHD version of 164 to more actively share how they manage this problem here. 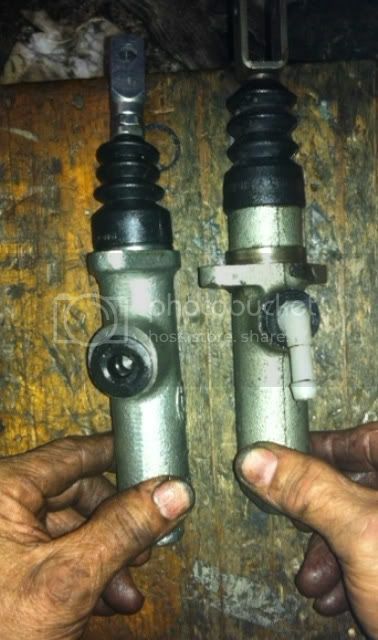 There is still a common belief that LHD and RHD 164 have the same clutch master cylinder. My search of many Alfa Romeo forums in RHD regions also found very few discussions about this. Am very curious how others solve their clutch problem, as this being a wear-and-tear item and the problem of looking for replacement parts should be common, I suppose. In Thailand we have RHD of course but all the 3 liters have an automatic gear box. The 2 liters are manual but I presume they use a different model master cylinder? Would it help if I check how they solve this problem? Yes, please. Not sure if 2.0 and 3.0 share the same clutch master, but it will be useful to know where they find parts for the 2.0 as there might be a chance that some shops or 164 owners or previous owners may still carry a spare clutch master. When I last checked with a supplier in Australia, only when we double-checked by verifying the pictures that it realized that the one it carried in stock was a LHD version which they received in error some years ago. I'm not sure if the 24v has the same master cylinder as the early 12v but I got mine from Lucas in the UK. BUT, the one they have listed for the 164 was not the same as mine. I had to modify it slightly to fit, but I think that was only because my car is one of the earliest 164s in the country. I believe the later cars like the 24v should fit without modification. It was not too expensive. I think it cost about £30 a couple of years ago. You should find that any motor factors in the UK will be able to supply one. Fitting it is a bugger of a job though! Be prepared for skinned knuckles and arthritic hands. Thanks for reviving this thread. My search continues. Just yesterday, my mechanic finished considering improvising a LHD version of clutch master cylinder and reported that everything fit except the orientation of the tube end inlet hole, and the space of RHD QV24 is such that there is no way you can fiddle with it unless you lift the engine So the LHD clutch master is now back to the box; would have to tolerate the almost failing master clutch cylinder now, by adding a spring near the slave cylinder to assure full and quick return. If folks do not fully understand the problem (and I am surprised that few of you raised this problem here; probably yours are LHD version where parts supply is not an issue). 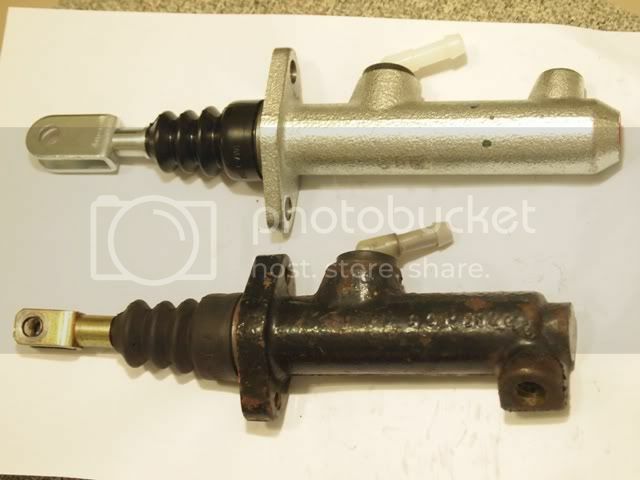 These pictures show the factory original master clutch cylinder (black, made by BendItalia) placed side by side an after market replacement (Lockheed) which I bought from Alfaholics in the UK. In my global search, I found an Alfa shop in Australia which happened to have a LHD version of the clutch master. I sent him pictures of my factory original and he said his looks the same as Alfaholics' Lockheed. When I asked if there are other possible substitutes, he suggested me look at Alfa 75's. 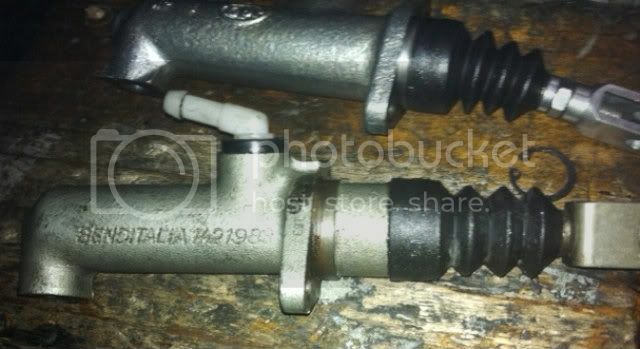 Here are his pictures of a RHD Alfa 75 clutch master cylinder. (c) the tube end inlet hole should face the opposite direction of the tube top inlet. My search continues, but would unlikely produce encouraging results. Mine has been rebuilt once, so it may not last any longer. So any advice will be most welcome. Nice clear pics! Ok so what I ended up doing was fitting the one with the output pointing straight out instead of down. I had to alter the angle of the outlet pipe a bit but it worked ok. However on mine I also had to change the plunger rod as it was a different length to the new one. However the alfa 75 one looks very similar to the real thing. If I recall correctly though the holes where the bolts go through on one of them (can't remember which sorry) were angled differently (twisted around so that the holes didn't line up). I think you may have to get a bit "creative", as I did. Oh one other thing was that one of the master cylinders that came close to fitting had threads in the mounting holes, whereas the others didn't. BUT...you mention that you have a problem with the pedal returning! I had the same problem which was caused by a broken spring inside the master cylinder. I still had a similar problem after the master cylinder was replaced just not so bad. It returns, but sometimes there is a short bit of slack on the first bit of movement on the clutch pedal. After ruling out both the pipework and the slave cylinder too, I eventually came to the conclusion that it is a faulty design. The arm that presses against the slave cylinder does not have quite enough spring tension to always push the piston back in all the way. I think this is down to what clutch you have fitted. I fitted an "LuK" clutch to replace a faulty "Sachs" unit that went juddery. It was ever since then that I've had the problem with the pedal not returning the whole way. The clutch is lighter now, which is nice, but it obviously is under-sprung. I've got used to it now and it never fails to be useable, nor gets stuck down and it doesn't slip or judder. But I too was contemplating fitting an extra spring on the slave unit somehow. I've yet to work out how though. The 164 RHD original has the engraving "BENDITALIA1421983" on the cylinder body. (b) the pot hole at the end is different in design - the 164 original allows direct plug-in of hose; the Alfa 75 does not. The mechanic had to be creative so he re-used the 164 cylinder case, remove and transfer the internals of the Alfa 75's to the 164's. The clutch works great now - took the opportunity of replacing the slave clutch cylinder, and adding a spring to ensure quick and full return of the clutch pedal. Nice work, and great it worked out! Here is an update. Trouble again. 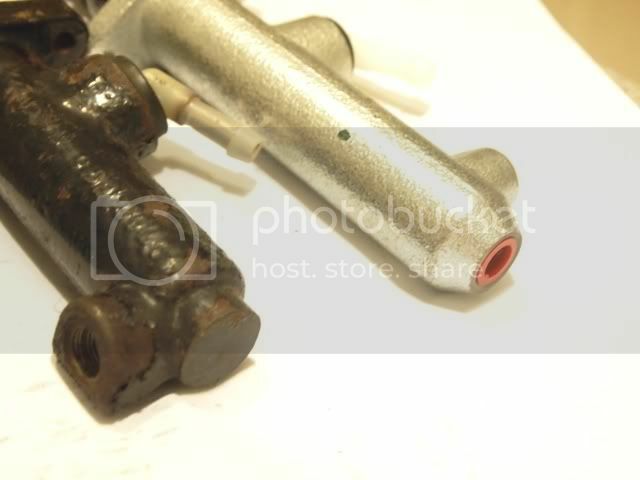 Two months ago, the brake fluid warning light came on and eventually found the leak in clutch master cylinder - the plastic elbow inlet tube broke and so drained all fluid. My mechanic replaced the tube and all was fine until two days ago. Same fault. Question is why did this happen again, at the same spot? Anyway. the incident revives my determination to find a good substitute. Found a possible substitute in the UK manufactured by "First Line" but was forewarned by others that product quality would be suspect... The pains continue. Wonder how other RHD 164s are surviving with the clutch master nightmare. You can see that the supplyline from the tank arrives under a different angle as well as the pressureline departs completely different. Sorry to hear you're still having problems. The plastic bit that you have had broken twice must be put under pressure by being misaligned I should think. There is so little room at the back there it is difficult to see but you have to make sure that none of the pipework fouls against other parts and bear in mind the rocking of the engine may be causing your problem. 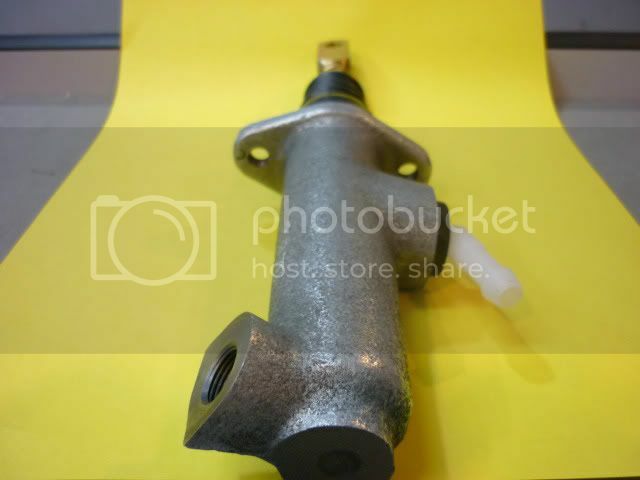 Judging from your pictures I have the LHD master cylinder fitted to my RHD car. I've driven thousands of miles on mine with the LHD one on and haven't had a snapped plastic bit. So I reckon you might have to re-route your pipework or change the length of it or something. I did think of reconditioning the old one on mine but the bore of it was scored and corroded so I couldn't re-use it. My LHD master cylinder works ok but I still haven't got around to fitting a spring like you have to make it return all the way. Gotta find a suitable spring. Just had another look at your pics. I don't think mine is a LHD one as the "wings" on mine were in the same place as the original. I only just noticed that in the pics you posted. Maybe mine is off a different alfa? Thanks, Tom. I think conversion from a near match would be the way out, either adjusting the pipeline or whatever. Problem is, which one (not necessarily Alfa) is a close match?